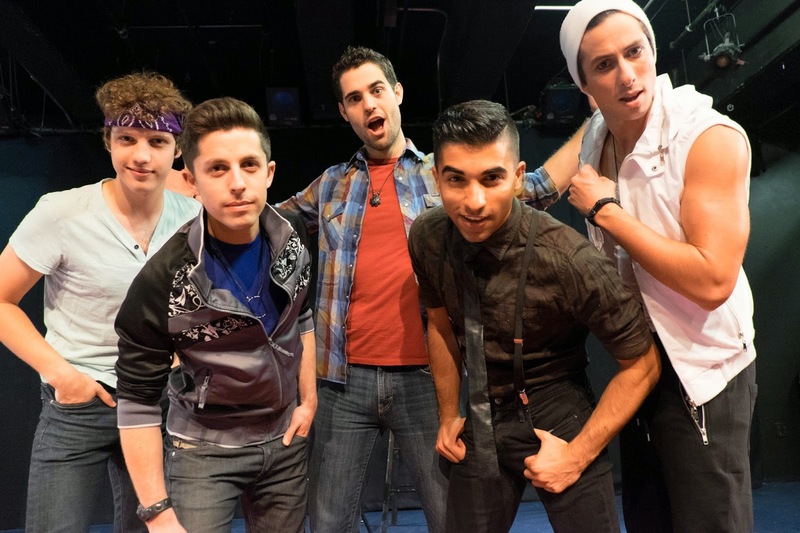 Pop Music becomes Worship Band in Altar Boyz, a fun, guilty-pleasure musical getting a run at Playhouse on Park. “Guilty,” because the musical, created by Marc Kessler and Ken Davenport, is the sort of cheesy, stereotypical show that we are supposed to call cheesy and stereotypical. Instead, we can’t help but smile and admit that we are having a good time. Obviously, I am not alone. The show won the 2005 Outer Critics Circle Award for Best New Off-Broadway Musical and ran for more than 2,000 performances, making it the ninth longest running show in Off-Broadway history. Here’s the cheesy: They have a the Soul Sensor DX-12, a machine that can show the number of lost souls in their audience on a video screen (Christopher Hoyt designs the stage with two large neon crosses and the four-man band under the musical direction of Robert James Tomasulo housed in the rear). The Boyz sing and pray their hearts out in hopes of seeing that number reach zero. Kevin Del Aguila’s book offers some plot in between musical numbers (the fast-moving show is 90 minutes with no intermission). Matthew is hiding a secret; Mark feels a bit more than he is willing to admit for the group’s leader; Juan wants to find the parents who abandoned him; Abraham wants to fit in and Luke isn’t the brightest bulb among the disciples (and seems to be constantly tugging at his pleather pants designed perhaps a tad too tightly by Erin Payne). Adding to the fun is interaction with the audience, which smiles and taps their feet from the moment they arrive (greeted by organ music). Laucella and Cassel (who portrayed Abraham in the show’s national tour) are the Equity representatives here. Kudos to Beaver who captures Mark's quirky character and whose singing voice stands out – give that Boy a solo in the church choir. Altar Boyz runs through Dec. 21 at Playhouse on Park, 244 Park Rd, West Hartford. Perfromances: Wednesday and Thursday at 7:30 pm; Friday and Saturday at 8 pm; Sunday at 2 pm. Tickets $15-$45. Additional special ticket offers are available. 860-523-5900 x10 or visit www.playhouseonpark.org.